In this report, Persistence Market Research (PMR) offers an eight year forecast of the global hepatitis C treatment market between 2016 and 2024. The current study reveals the market trends and market dynamics that are expected to positively affect the current market environment and future scenario of the hepatitis C treatment market over the forecast period. The global hepatitis C treatment market report begins with the executive summary and definitions of various categories and their usage in various industries. It is followed by market overview of the global hepatitis C treatment market, which includes PMR’s analysis of market trends, drivers, restraints and opportunities that are affecting growth of the global hepatitis C treatment market. Furthermore, to understand the popularity of the market segment and regions, the attractiveness index with elaborated insights on the same is provided, which will show the market’s attractiveness based on factors such as CAGR and incremental $ opportunity. In the final section of the report on global hepatitis C treatment market, the ‘dashboard view’ of the companies is provided to compare the current industrial scenario and their contribution to the total hepatitis C treatment market. Moreover, it is primarily designed to provide clients with an objective and detailed comparative assessment of key providers specific to a market segment. Report audiences can gain segment-specific manufacturer insights to identify and evaluate key competitors based on an in-depth assessment of their capabilities and success in the hepatitis C treatment marketplace. To ascertain the global hepatitis C treatment market size, we have taken into account the revenue generated by the various hepatitis C treatment drug manufacturers globally. The forecast presented here assesses the total revenue generated by value across the global hepatitis C treatment market. In order to provide an accurate forecast, we initiated by sizing up the current market, which forms the basis on how the hepatitis C treatment market is expected to develop in the future. Given the characteristics of the market, we triangulated the outcome on the basis of three different types of analysis; based on supply side, downstream industry demand and the economic envelope. In addition, it is imperative to note that in an ever-fluctuating global economy, we not only conduct forecasts in terms of CAGR, but also analyze the market based on key parameters, such as year-on-year (Y-o-Y) growth rates, to understand the predictability of the global hepatitis C treatment market and identify the right opportunities across the market. The hepatitis C treatment market has been analyzed in terms of basis point share (BPS) to understand the individual segments’ relative contributions to market growth. This detailed level of information is important for identifying various key trends in the global hepatitis C treatment market. The global hepatitis C treatment market is projected to be valued at US$ 23.9 Bn by the end of 2015 and is further expected to reach US$ 71.13 Bn by the end of 2024, registering a CAGR of 13.1% over the forecast period of 2016-2024. Developing countries such as India, China and Brazil have a large patient pool compared to other developed countries. This increases demand for hepatitis C treatment drugs. Few countries and state governments have taken initiatives to control hepatitis C infection by subsidizing drugs or by giving special funds towards disease treatment programs. Various private NGOs create awareness and educate the population to help fight against the hepatitis C infection. These may also be considered as drivers for the Hepatitis C treatment market. Prevalence of hepatitis C infection among the global populace is increasing. This is mainly caused by sharing needles, unsterilized medical equipment, and blood transfusion from infected mother to new born baby. In hepatitis C infection treatment, there are around 2300 molecules in pipeline studies and around 300 in phase 4 studies. Various companies are getting involved in the development of hepatitis C treatment medication. This would lead to development of new products, which ultimately drives the market. High cost of drugs is the top restraint for the market, as cost of the therapy is much higher and the general population cannot afford the treatment. For example, cost of Harvoni (Ledipasvir & Sofosbuvir) medicine is US$ 94,500 for 12 week treatment that is around US$ 1100 per pill. Stringent regulatory norms hinder early approvals and derail commercialization of products, which ultimately hampers market growth. Different countries have different regulation bodies to approve the drugs for disease treatment. Due to this, drugs are not easily approved in the market, affecting the availability of products in the market. According to The United States Attorney General (A.G.) more than 50% doctors who prescribed Harvoni were denied coverage by their insurer. Insurance providers deny reimbursement requests due to high treatment cost. Moreover, payers reimburse very small amount of total cost of the treatment which ultimately reduces overall market size. By drug class, the combination therapy segment accounted for about 66.2% share of the overall market value in 2015. 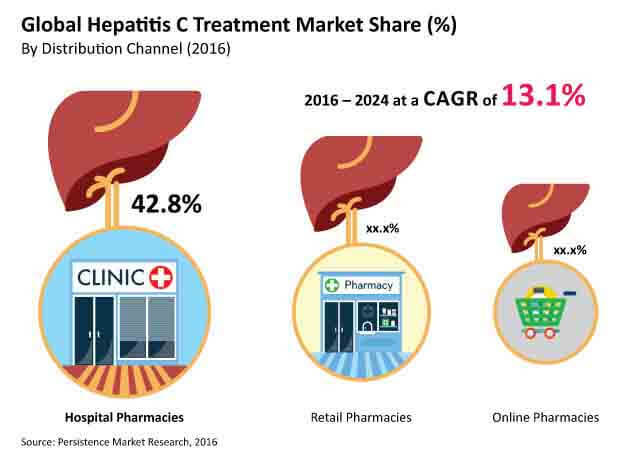 By distribution channel, the hospital pharmacies segment is estimated to account for the highest market share of 42.8% of the global hepatitis C treatment market by 2016 end while the retail pharmacies segment is estimated to account for 34.2% market share in 2016. The global hepatitis C treatment market was valued at US$ 23.9 Bn in 2015. North America was the largest market for hepatitis C treatment, accounting for over 45.6% revenue share of the overall market in 2015, followed by Europe with around 19.4% share. The Asia Pacific market is expected to exhibit the highest CAGR of 14.8% during the forecast period (2016–2024), followed by Latin America. Key players of the global hepatitis C treatment market include AbbVie Inc., Bristol-Myers Squibb Company, F Hoffmann-La Roche Ltd, Gilead Sciences, Inc., Johnson & Johnson, Kadmon Holdings, Inc. and Merck & Co., Inc. The market is consolidated with a few key players in which Gilead Sciences, Inc. contributes around 80.1% of the market share, generating majority of the revenue from the sales of drugs Harvoni and Sovaldi followed by Bristol-Myers Squibb Company and AbbVie Inc.